Tough Tamperproof Labels for All Your Security Purposes | Data Graphics Inc. Tough Tamperproof Labels for All Your Security Purposes | Data Graphics Inc.
A tamperproof label can provide product security by ensuring that expensive items, such as electronic devices, have not been altered from their original condition. One of the smartest and most cost-effective investments you can make is to use a tamper proof sticker or label to protect your high-value electronic and mechanical equipment. Taking this extra precaution guards against unauthorized tampering and protects the viability of the product. No matter what your needs, we can create a custom tamperproof label that meets even the most exacting security standards. 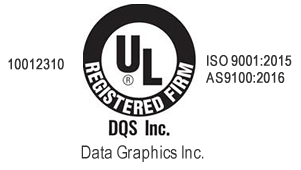 Our tamperproof seals are also a great way to discourage unauthorized tampering with expensive products, like computers or machines, under warranty. If tampering will render the warranty null and void, this label can tell you if the customer has violated your warranty by attempting to service your product himself. We offer tamperproof labels that can be affixed over an opening in the product’s exterior. If removed, the consumer will not be able to reattach the label. 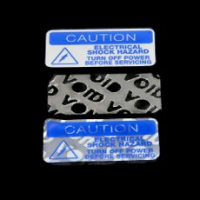 If one of these labels is removed, the word “void” will be left where the sticker had been applied. If your customers know that tampering will be detected and void their warranty, they are less apt to try it. Our tamperproof labels help ensure only qualified repair technicians, such as your own employees, make repairs to your products. That saves you money by voiding the warranty on products that underwent unauthorized repairs and were damaged. Other labels are impossible to be removed in one piece. If you try to remove the label, it breaks down into dozens of tiny pieces, making replacement of the label in an attempt to disguise unauthorized entry impossible. Get a quote on our tamperproof labels and see how this small investment can start having a big impact on your company’s profits. "Shianne Conn is one of our five inside sales representatives. Shianne has nearly two decades of sales/customer service experience. Shianne is responsible for working directly with our customers in all quoting, order entry and follow-up situations. She has grown her customer base during her time with our sales team because of her excellent customer service. Her customers and co-workers adore her." "Tony McCullough has worked in several departments at Data Graphics, initially cleaning screens, then moving into our Yellow Room preparing screens. He has also worked in the Assembly Department. Tony currently operates one of our three 50-ton die-cutting presses. Outside of Data Graphics, Tony is a single father raising his two sons, Wayne and Bo, who are both in high school. They enjoy golf, baseball, softball, volleyball and Tony has coached most of their teams over the years. "The best part of our lives is our church, Mid-Lake Christian Church." Tony is a deacon, youth leader, volleyball ministry leader, and coach in the Youth Sports Ministry. His work motto is Colossians 3:23-"Whatever you do, work heartily, as for the Lord and not for men." Tony says, in his own words, "put 110% in whatever you do and your rewards will be greater in heaven." "Cathy Hutcheson started with DG by working on the production side, with various roles in the screening department. She spent seven years in inspection, and was even our Inspection Supervisor for a time. In 2004, Cathy found her way into the Sales Department where she truly found her love working directly with our customers." "After retiring from his own textile printing business, Dave Gerberich decided he needed more to keep him busy during the day. Dave is currently one of our main screen press operators. Dave has been married for more than four decades to his lovely wife Merry. They have two children, a daughter, Dawn, who lives in North Carolina, and a son, Patrick, who recently became a Pharmacist and lives in Jacksonville. They also have two grandchildren. Dave has served in the US Army. Dave's motto is that it is always 5 o'clock somewhere!!" "Vernon Kemp has operated many of our presses over the years. He started out in our Screening Department, then spent about a year in our Roll Label Department, running the hot stamp presses. Vernon eventually made it back to our Screening Department and now heads that department as our Screening Supervisor. Vernon and his wife Sherry have two beautiful daughters, Kayla and Shelby, who have him wrapped around their fingers. Vernon is the DG "go-to" person when you want to find out a little something about fishing. He currently holds three titles for American Bass Angler of the Year. He is in Bass tournaments 48 weekends out of the year...and the other four are for hunting. " "Mike Thurman has operated many of our presses, primarily on the printing side. He started out in our Assembly Department, then very quickly earned a position as a screen printer. Mike currently runs our Digital Printing Department. He operates two digital presses, as well as our UV Screen-printing press. Mike was born and raised in Lake County. Like most Southern-raised men, he enjoys hunting and fishing. Mike also has a fascination with motorcycles. " "Eric Yelvington has become multi-talented in our Fabrication Department. Eric currently runs our CNC, laser and die presses. There is rarely an opportunity he allows our sales team to turn down, always willing to try new things. Eric is a native Floridian. Born in Daytona, he eventually made his way to Lake County in December 2003. Eric is an Eagle Scout, the highest attainable ranking through Boy Scouts of America. He enjoys hunting and fishing on the weekends, and of course hanging out with his wife." "Jennifer Mullins is a versatile, veteran printer. She came to us with five years experience in the printing industry before joining the Data Graphics Team. Jen has worked in several departments, initially in the Screen Printing Department, the ink room, and as a screen press operator. She now runs our Roll Labels Department, and primarily operates our Flexography presses and digital roll press. She is also trained on our hot stamp and thermal presses. Born and raised in Central Florida, Jen enjoys spending time with her family, especially the furry ones. Jen has one son, Tyler, and a grandson, Hank, as well as her rescued pets, which include three dogs, three cats, a horse and a parrot. Growing up on Lake George, she enjoys being on the water and all of the activities to go along with the outdoors." "Meet the man behind your t-shirts and promotional items, Steve Salvo. Steve was hired in 2008 as our Promotions Production Manager due to his extensive experience. Steve runs our Promotions Production floor and brings much experience from the apparel printing and embroidery industry to Data Graphics. Prior to being Production Manager at DG, Steve was a Production Manager at a major collegiate sports printing shop in Leesburg, Florida. Prior to that, he was a graphic designers for an area magazine. Steve joined the military in 2002 and was in the 82nd Airborne Unit serving our country overseas. He completed a combat tour in Iraq from 2003 through 2004. Steve left the service in 2007 and shortly after joined the DG team. Born and raised in Brooklyn, NY, Steve moved to Florida in 1978. In Steve’s spare time, he enjoys riding his Ducati in the Central Florida area. However, he enjoys riding in the Tennessee mountains the most. Steve is also the father of two kids, Emily and Josh." "Meet the man behind the packages, Adam Rodriguez. Adam started with Data Graphics in 2008, working in various departments. He has assisted in Sales, and various Production Departments. Adam ultimately landed in our Shipping Department. Now the head of our Shipping Department, Adam makes sure your packages make it to the right place, at the right time. Adam was born and raised in Key West, Florida. When he was 16, his family moved to Eustis, where he currently resides with his wife and two children. His daughter will be off to college in the fall and his son is very active in baseball. Adam’s fondest memory working at Data Graphics was working with Bob Jenkins (now retired), “Man that guy had some great stories!” Overall the biggest highlight is “being able to interact with the rest of the great employees here at DG." "Meet one of the men behind the printing of your labels and overlays, Jamar Barriner. 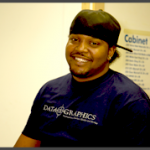 Jamar joined Data Graphics with extensive printing experience. Jamar has been trained for the Yellow Room which is where all of our screens are burned, and he was also trained on our hand table presses, which are used for small production runs. He currently resides in Mount Plymouth, Florida and enjoys working in his yard and home in his spare time. Jamar also has two brothers that work here at DG. Jamar is the father to two daughters, Hazzelyn and Jazzelyn, and is a doting father."